Aaguacateros Michoacan (LNBP) strengthened their roster with addition of 31-year old Colombian international guard Michaell Jackson (190-87). 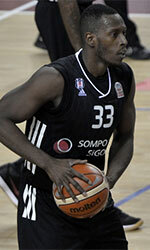 He played last summer at Bucaneros in Venezuelan LPB league. Jackson managed to play in three leagues in three countries last year. In only one LPB game he recorded very impressive stats: 18 points, 10 rebounds, 2 assists and 2 steals. He also played for Brujos Izalco (Liga MB) in league where in 14 games he was second best scorer with remarkable 28.0ppg and had 11.9rpg, 7.3apg (leader !!!) and 4.5spg (leader !!!). Jackson helped them to win the league title. 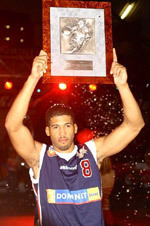 Great season indeed as he was selected Latinbasket.com All-El Salvador Liga Mayor Torneo Apertura Defensive Player of the Year, Finals MVP and voted to 2nd Team. He also represented Colombia at the Central American and Caribbean Games in Barranquilla (Colombia) this year. Jackson's team won Silver and his stats at that event were 4 games: Score-2 (18.5ppg), Reb-3 (9.5rpg), 1.8apg, Steals-2 (2.3spg), 1.0bpg, FGP: 45.8%, 3PT: 30.8%, FT: 72.0%. Jackson is quite experienced player. He has played also professionally in Argentina (Olimpico de La Banda), Costa Rica (Liceo and Escazu), Colombia (Patriotas, Academia, Islanders, Cimarrones and Patriotas) and El Salvador (Aguila). The scouts decsribe him following way: A very good shooter from every side of the court, he's matured and now playes at star level. Very quick player. Lots of experience. Not afraid to shot in front of taller defenders.